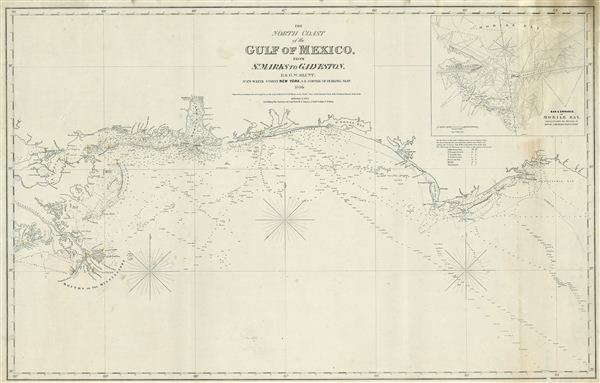 Scarce nautical chart of the Gulf Coast. The North Coast of th Gulf of Mexico from St. Marks to Galveston. An extremely scarce 1865 nautical chart or maritime map of the Gulf Coast by e and G. W. Blunt. This map, though titled ‘From St. Marks to Galveston' in fact only follows the coast from St. Marks to the Delta of the Mississippi River – suggesting that a companion piece may have been planned for future updates. The Blunts first issued this chart in 1842 with several updated editions following – the present example being the 1865 edition. The map offers excellent coastal detail and countless depth soundings throughout. A detailed inset in the upper right quadrant focuses on the ‘Bar and entrance of Mobile Bay.' A fine and scarce example of this beautiful nautical chart. Very good. Some warping and minor discolorations.